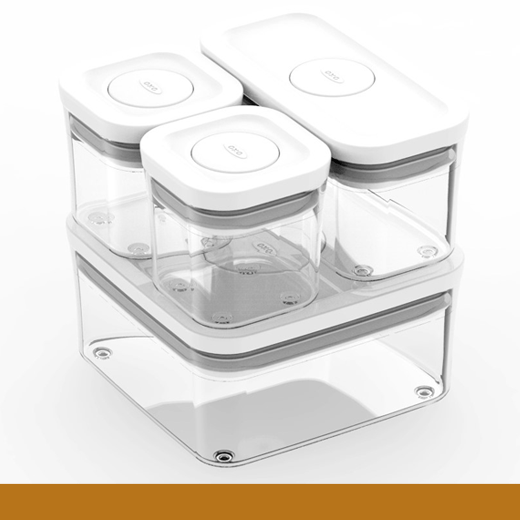 The OXO Good Grip POP container is a closed container for dried food with single-handed operations. Users can open and close the lid by simply pushing a button in the center. Thanks to one-handed usability, the opening and closing is available at once even during cooking. The variety of sizes are completely designed for realizing the stacking modularly. In addition, the thin lid and slim styling has increased storage capacity. Designed by: Tamotsu Matsumoto, Makiko Kida and Taiki Nosaka of FORM Co., Ltd. for OXO International, Ltd.